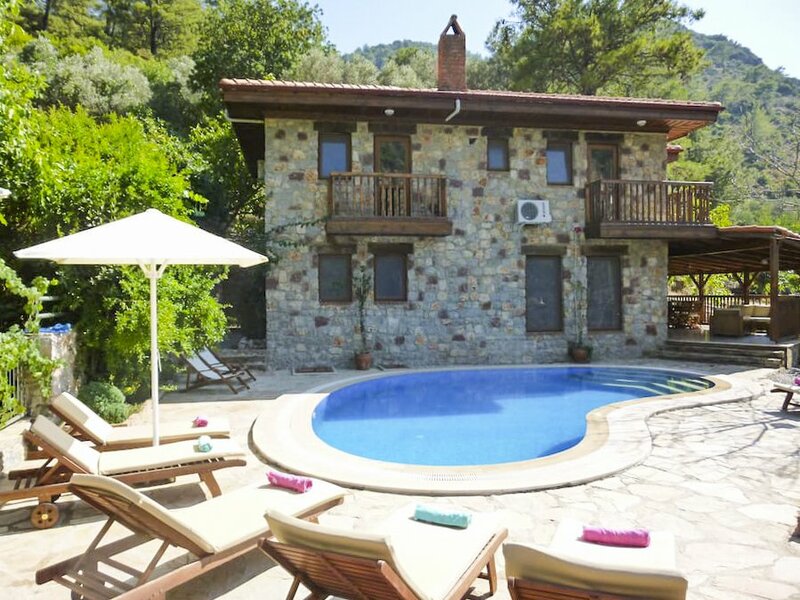 Discover a beautiful part of rural Turkey at four-bedroomed Villa Kizkumu, a traditional rustic stone-built villa nestled in the sleepy village of Orhaniye. 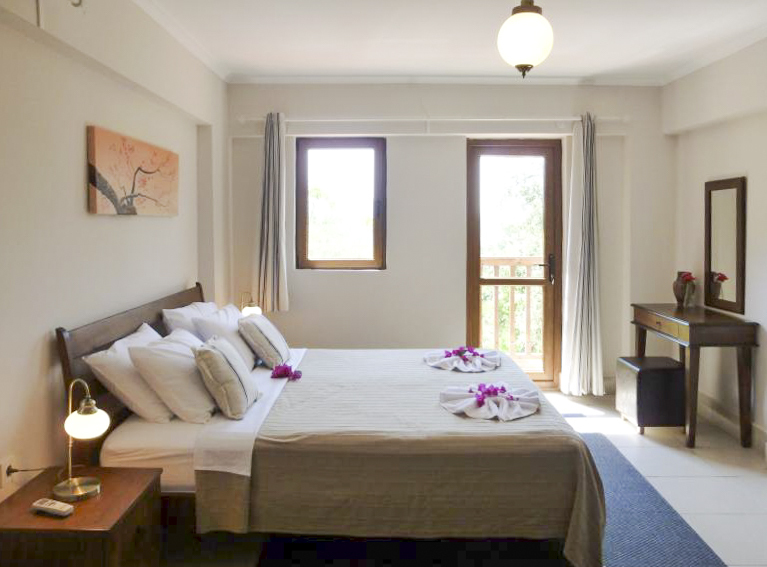 Cut into the hillside, the villa boasts picturesque views of the pine-tree lined mountains and sweeping Orhaniye Bay. With only one neighbour and peaceful surrounds of fields, farms and trees, it’s the perfect place to relax. Sunbathe on one of the cushioned loungers, cool off in the outdoor swimming pool or pick a book from the library (there are over 250 to choose from) and find a shaded corner of the garden to curl up in. Inside, the décor continues its warm and homely feel with dark wood features and traditional artwork like hand-crafted glass lighting. 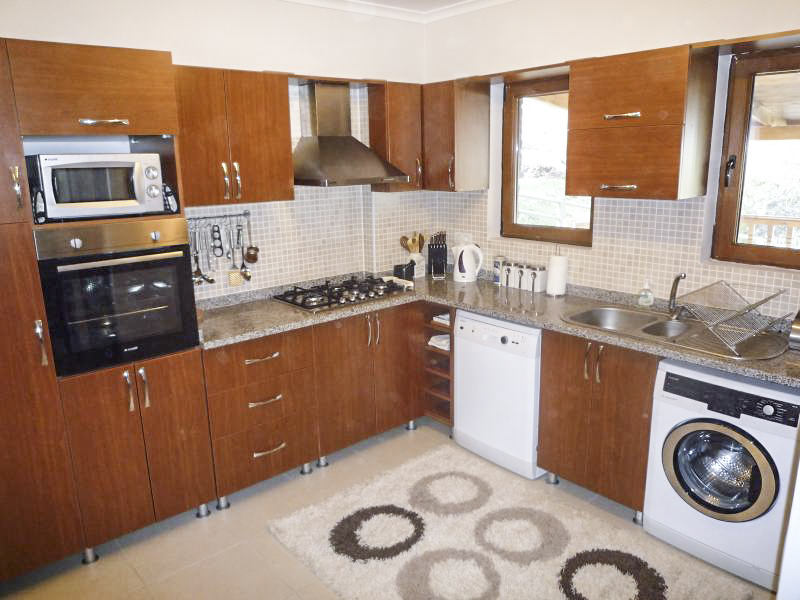 There’s an open-plan living, kitchen and dining room. 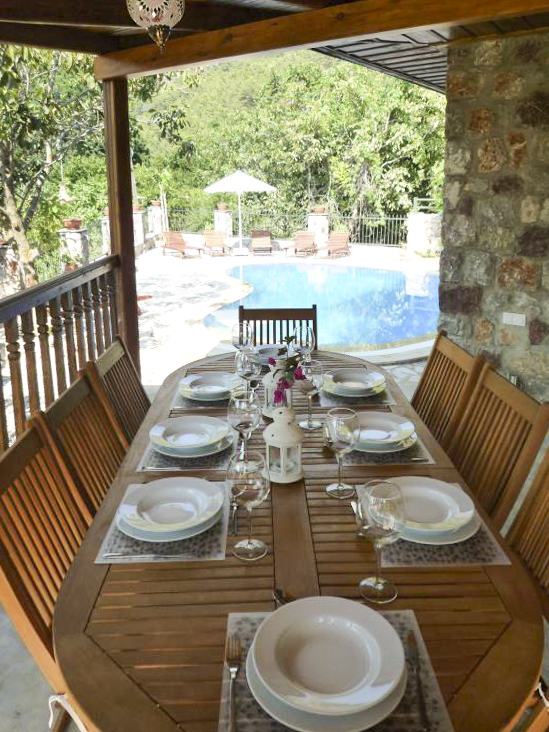 The spacious area is equipped with comfortable sofas, a television and there’s also free Wi-Fi throughout the villa so you can contact your family and friends back home. 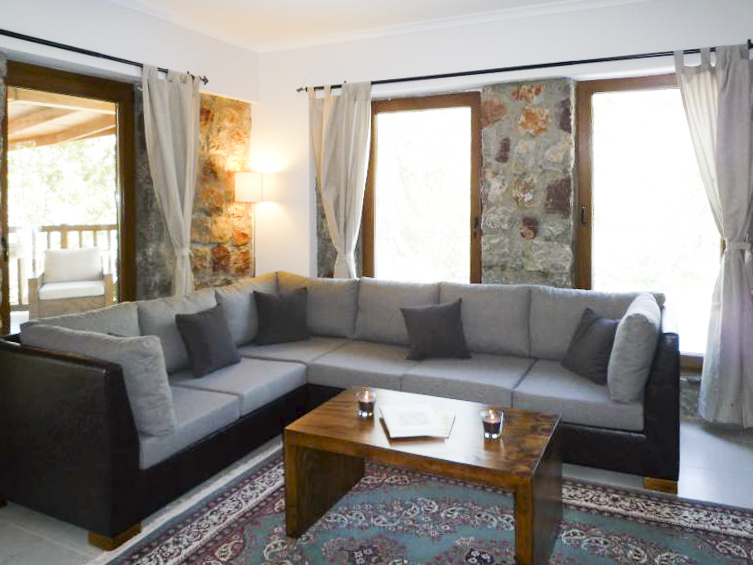 Traditional patterned Turkish carpets adorn the floors, and there are large windows looking out over the garden and pool terrace. 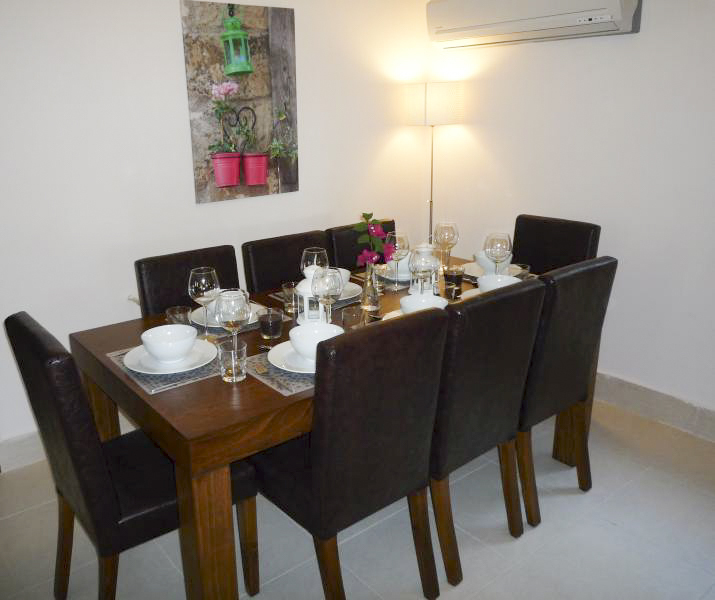 Outside, there’s plenty of seating spots, as well as an alfresco dining table and a stone barbeque for cooking up that fresh locally-bought Aegean seafood. Oh, and your neighbours can supply you with home-grown village produce, such as organic honey, milk and eggs! 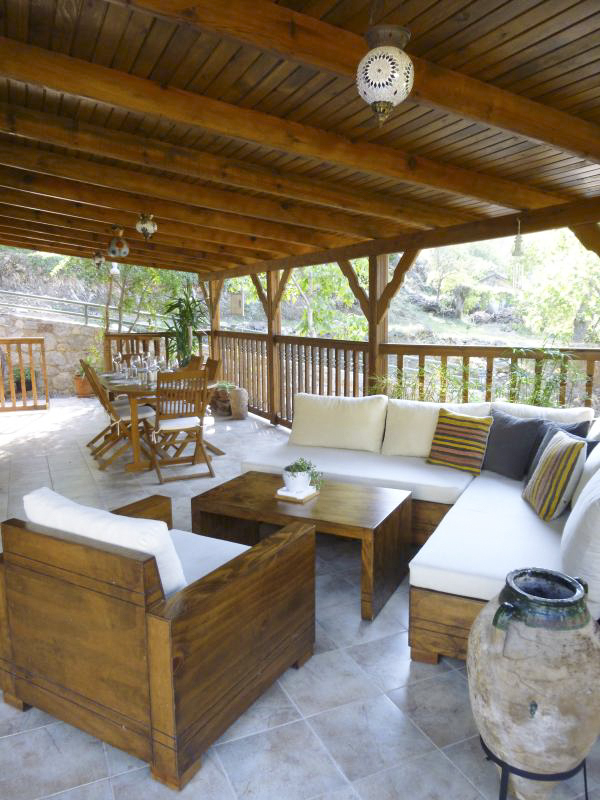 It’s truly a rural get-away within an authentic and working Turkish village. The kidney-shaped pool is generously-sized, and a part of it is always in the shade – perfect for young kids to swim all-day without always being in the sun. The bedrooms are equally inviting. There are two doubles and two twin rooms, sleeping up to eight. 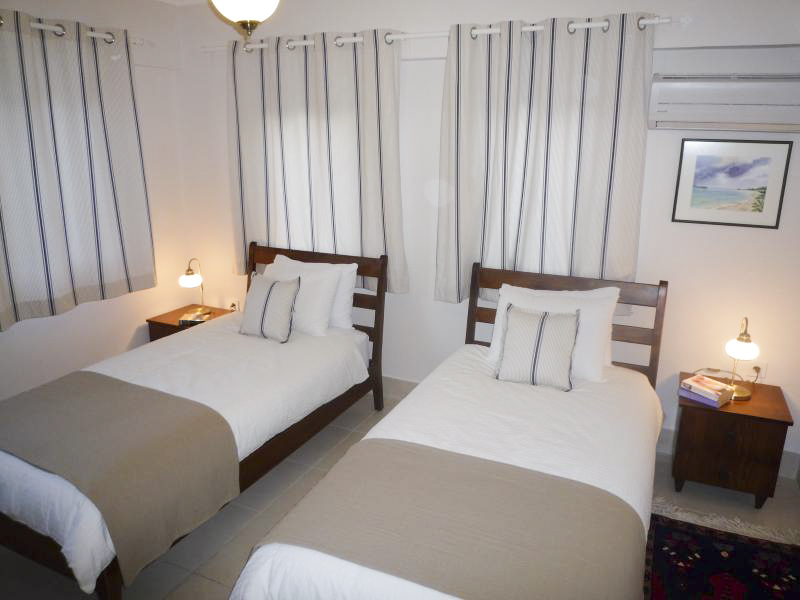 The master bedroom, double room and one of the twin rooms are all en-suite and are located on the first floor, while the remaining twin room is on the ground floor and shares the family bathroom. All linen, towels and hairdryers are provided, so you check them off your must-pack list. If you’d like to go exploring, hop on the four adult bicycles (+1 child) and head for the harbour. 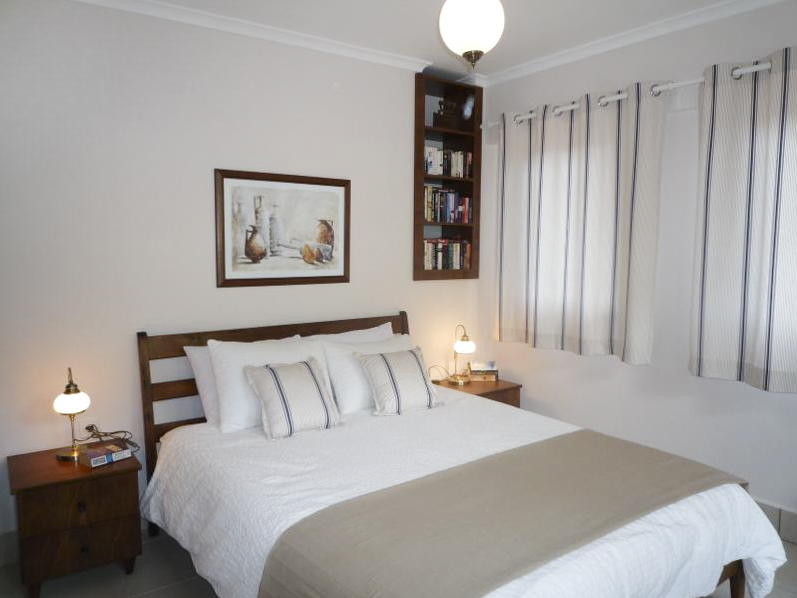 When you get back, there are board games, puzzles and plenty of DVDs to keep the whole family entertained. Orhaniye is a small rural village on the beautiful Bozburun Peninsula in Turkey. 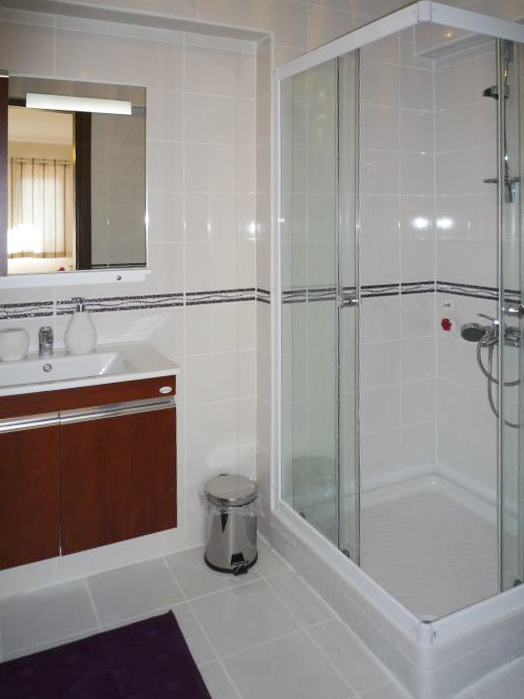 It’s a short 25 minute drive from the popular holiday resort Marmaris. Dotted with small-holdings and olive vineyards, it’s truly traditional Turkey at its finest. Most of the locals work their land for a living. Think bee-keeping, orange, mandarin and pomegranate groves, as well as peanuts and herbs. Look out for fresh produce in the shops or at the Saturday market in front of the Mayor’s Office. At the latter, you can buy everything from fresh fruit and vegetables to clothes, olive oil and village bread. The quaint village also boasts a restaurant-fronted waterfront, that’s a popular place for yachts to anchor. For days spent on the sand, head to Kizkumu beach, one of the most beautiful beaches in the region. It has a sand spit reaching some 500 metres out into Orhaniye Bay. The surrounding mountainous Bozburun Peninsula is also the perfect place to explore. For an adventure, jump on your bicycles and roll down the winding country roads into more quaint villages like Turgutkoy, Hisaronu or Selimiye (10km away). There you’ll find a beautiful harbour and the ancient city of Hydas is nearby. The three castles, lighthouse and monastery remnants are all worth seeing. 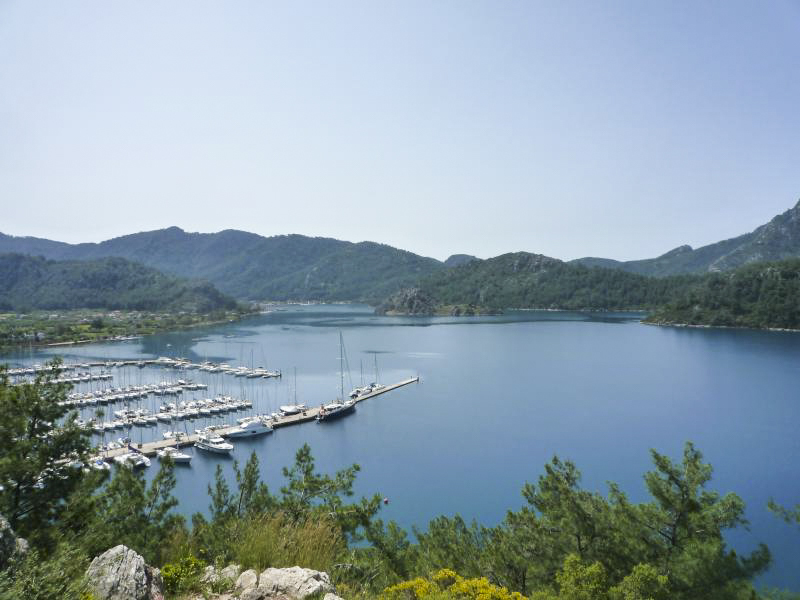 Marmaris is renowned for its popular pebbly beach and long seafront promenade – with plenty of opportunities to take part in water sports. The bustling resort town is also known for its lively nightlife and shopping, charming 1500s castle and sailing and scuba diving opportunities.